Wii Sports Resort was released in July of this year, and has 163,070 players reporting data so far. Wii Fit Plus was released in October, and has 27,310 players reporting data. New Super Mario Bros. Wii was just released last month, on November 15, and already has 51,180 players reporting data on the Nintendo Channel. Wii Sports Resort's Amazon.com sale rank was #11 and it's MSRP is $49.99. Wii Fit Plus' Amazon.com sale rank was #3(game with board) and #20 for just the software. The MSRP for the game with Balance Board is $94.99, and the MSRP for just the software is $19.96. 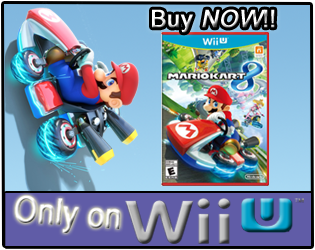 New Super Mario Bros. Wii's Amazon.com sale rank was #6 and it's MSRP is $49.99. 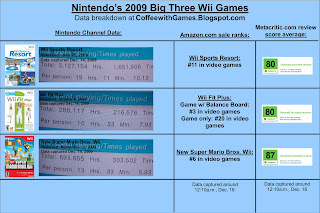 The review score averages for the games has stayed the same, only New Super Mario Bros. Wii gained one more review score to it's total, bringing it to 73 "MetaCritic" reviews and counting. It should be noted, New Super Mario Bros. Wii, at the time of this post(Dec. 16, 12:45am), is sold out on Amazon.com, Target.com, ToysRUs.com, and is backordered on BestBuy.com. As of around 8:10pm(EST) WalMart.com was sold out of the game as well, but looks to have it back in stock now. I can't recall the last time a game was selling out like this, just consoles. Can anybody else recall a game selling out like New Super Mario Bros. Wii has been doing for the last week on various websites? Last week I stated, "The sale ranks for the three games on Amazon.com, probably don't reflect the true sales, because Amazon.com did actually sell out of New Super Mario Bros. Wii, and won't have the game back in stock until Dec. 13! While Amazon is doing pre-orders, it's probably definitely affected sales of New Super Mario Bros. Wii, with customers going elsewhere to buy the game online." From the data I've seen, with the different websites being out of stock this week, it looks like that may very well be true. While Amazon.com did get New Super Mario Bros. Wii back in stock on December 13, it sold out again that same day! New Super Mario Bros. Wii gained 10,642 players reporting data on the Nintendo Channel this week, making its total 51,180. New Super Mario Bros. Wii is now ahead The Conduit, in total numbers of players reporting play-time data on the Nintendo Channel. To any of the readers that have already bought and played through New Super Mario Bros. Wii, if you've beaten the game, have you found yourself going back to play it again? Or is one play-through of the game enough for you? The same as last week, I'll keep this until the data for Monday, December 28 is updated and I can see if my "prediction" was right. *Update: As of 2:30p.m. (12/16/2009) ToysRUs.com and WalMart.com had New Super Mario Bros. Wii back in stock, while sites like Amazon.com, Target.com, BestBuy.com, and even GameStop.com, were either out of stock or backordered on New Super Mario Bros. Wii! Of course people selling on Amazon and Ebay have the game for sale. But you're going to pay $70-$100 for it. I think I will get this game actually. I loved SMW and finding all 96 levels and the special area that had harder levels. Hopefully this game has all that. If not, it'll still be fun to play through 8 worlds. @Stan: If you visit Amazon.com's NSMBW page, it says, "In stock on December 18, 2009". Amazon.com is allowing you to "order" it, but it won't ship until they get it back in stock. @Nicodemus at Nite: Are you one of those "people" selling the game on Ebay for $70? @Coffeewithgames: That's something that I will keep to myself!! @Brenda Sewel: It is interesting how there are several sites like ehow.com that have a "notification" system to help consumers find products they're looking for. 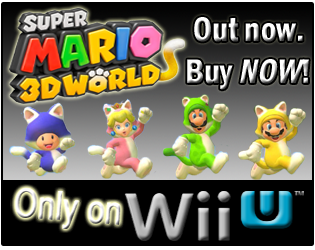 I wouldn't doubt it if you were causing the mass shortage of New Super Mario Bros. Wii!